Monthly Package w/ materials to create at least (3) blocks completing at 6.5” square, this is a near-mindless speed piecing technique designed to be wonky rendering each block stress-free & one of a kind. 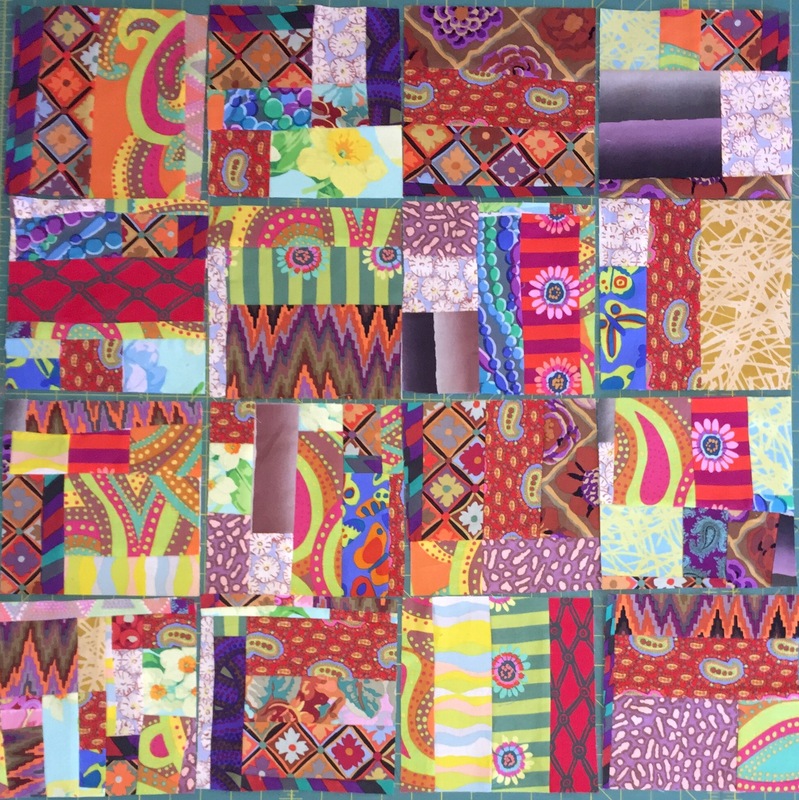 The photo shows a completed quilt using these blocks, and one of our members created the 30 blocks in just one afternoon. This group is therapy and we will sew along virtually : much fun each month, (optional), the second photo shows the block styles , a few examples for visual affect only, each is one of a kind using this speed-piecing technique. One Colorway Option for this Club: Fabrics will be a KFC/Negley Variety meaning: all prints will be from Kaffe Fassett, Philip Jacobs, Brandon Mably, or Martha Negley , variety of colors all year. THIS IS A 12 MONTH COMMITMENT , AND A MONTHLY KIT WITH FABRIC WILL ARRIVE SHIPPED TO YOU EACH MONTH. THIS IS A FACEBOOK GROUP , SO ONLINE TUTORIALS WILL ACCOMPANY THIS SUBSCRIPTION IN VIVID DETAIL : no location required, this is virtual fun that shows up in your mailbox, so you may sew with us from your pajamas at home. We will sew virtually using our Facebook Groups and associated blogs.